Contact us directly if you have any questions about selling or purchasing a Rob Roy home. Amenities typical to homes in the community include guest suites, large outdoor living areas, tree covered terraces, swimming pools, and backyard waterfalls. Shared amenities include nearby Lake Austin, which offers residents a chance to sail, water ski, and fish. Residents also can enjoy the Wild Basin Wilderness Preserve, which is less than two miles away, the Emma Long Metropolitan Park, and golf courses. The homeowners’ association has an active social committee that organizes events for neighbors throughout the year. In addition to the beauty and convenience of the neighborhood, families are often drawn to Rob Roy because of its proximity to the Eanes Independent School District, one of the highest regarded public school systems in the state. The community, with easy access to the Capital of Texas Highway, is a short 15 minute drive from downtown offices and entertainment, 10 minutes from schools and golf courses, and 20 minutes from Lake Travis, making it one of the most popular places to find an Austin luxury home for sale. First established in 1982, Rob Roy has experienced several growth cycles, with most of the neighborhood built out by the late 1990s, and new homes are still being added. Rob Roy homes are situated on estate-sized lots of one acre or more, and are often customized with exquisite and elegant details. Though homes vary in architectural style from modern to traditional, many are constructed using native stone, helping to blend the homes seamlessly into the Hill Country landscape. Rob Roy is located in West Lake Hills between Lake Austin and the Capital of Texas Highway, north of Bee Caves Road. It is nine miles from downtown (see Austin homes for sale,) making it a 15 minute commute in normal traffic. Its location between beautiful and scenic hill country and the busy downtown area makes the 78736 (see 78736 homes for sale) and 78733 zip codes (see 78733 homes for sale) popular for homebuyers in the luxury market. Rob Roy is perfectly positioned between the natural beauty of Austin and Austin’s urban entertainment and business centers. Residents can find nearby hiking and biking trails, vast expanses of wilderness preserve, basketball courts, tennis courts, picnic areas, water access, and golf courses. Runners and cyclists can enjoy 7.5 miles of mostly shaded, private roads within Roy Roy’s gated neighborhood. The Wild Basin Wilderness Preserve is less than two miles away from Rob Roy neighborhoods. The 227-acre area contains two and half miles of hiking trails that wind through grasslands, woodlands, and streamside habitats. To help keep the natural beauty of the area, picnics, pets, and bikes are prohibited in the preserve. The trails are open sunrise to sunset every day. The Emma Long Metropolitan Park is three miles from Rob Roy and is known as one of the largest parks in the city. It features barbeque pits, picnic shelters, volleyball and basketball courts, and more than 10 miles of trails to hike, jog, or bike. The park is set within an oak and juniper forest bordering Lake Austin. The main part of the park, adjacent to the lake, features a well-equipped and well-used boat dock, as well as several swimming areas. Other parks close to Rob Roy include the Barton Creek Wilderness Park, with miles of hike and bike trails contained inside the Barton Creek Greenbelt. The Austin Country Club is the oldest golf club in the city, founded in 1899 as the Austin Golf Club by Lewis Hancock. The Club consists of a 180-acre, 18-hole Pete Dye design golf course, Harvey Penick learning center, 10 lighted tennis courts (two of which are clay surface), a heated swimming pool, fitness facility, boat slips, and a large clubhouse. The clubhouse includes various dining areas, a large ballroom and meeting room facilities, as well as men's and ladies' locker rooms. Residents of Rob Roy who love golf will find themselves close to many courses, with several contained within the award-winning Barton Creek Resort and Spa. The facility opened in 1986 and is made up of four challenging courses, as well as the Barton Creek Golf Academy, which can help players enhance their game. In addition to golf, the resort features indoor and outdoor pools, a tennis court, an 18-hole miniature golf course, and a luxurious spa. The four championship golf courses include the signature Fazio Foothills, the impressive Fazio Canyons, the stunning Crenshaw Cliffside, and the secluded Palmer Lakeside. Each 18-hole course combines the visions of some of the game’s greatest legends with the unparalleled beauty of the famed Texas Hill Country. The Austin Country Club has a 57 boat slip Marina available for private lease to Resident, Junior and Senior Members. Boat Club membership is also available to members, allowing for year-round boating enjoyment without the maintenance involved with boat ownership. The Club also has a 50-meter heated pool that is home to the Austin Country Club Dolphins swim team. The pool provides full entertainment and scenic views for members during the summer months and adult lap swimming into the winter season. Private swim lessons for preschoolers through triathletes are available year round. The Barton Creek Resort and Spa offers two resort swimming pools. In addition to swimming or sunning poolside, guests can visit the Pool Cabana, where favorite drinks and light fare are available for enjoyment. Lake Austin is a water reservoir on the Colorado River in Austin and borders the Rob Roy neighborhood. Lake Austin is one of the seven Highland Lakes created by the Lower Colorado River Authority and is used for flood control, electrical power generation, and recreation. Recreation opportunities include boating, waterskiing, swimming, and fishing. Lake Austin winds its way through the city, making its way through 220 parks scattered throughout Austin, including the 360-acre Zilker Park and a 10.1 mile hike-and-bike trail around Lady Bird Lake. The Barton Springs Pool, adjacent to Lake Austin, welcomes swimmers to 68-degree, spring-fed waters year-round. Located near the Tom Miller Dam on the west shore of Lake Austin, the Lake Austin Marina features 168 boat slips of varying sizes and features, as well as a Ship Store. The marina is also home to some of Austin's most luxurious commercial office space. Tenants have 24-hour access to the marina through conveniently located security gates surrounding the property. All slips are covered and feature six different types of lifts to accommodate varying boat sizes. Residents of the Rob Roy neighborhood are located in close proximity to a variety of shopping centers that include upscale retail, restaurants, and cinemas. Davenport Village is a collection of shops, restaurants, and businesses along Capital of Texas Highway. Restaurants include Eleven Plates and Wine, 360 Uno Trattoria and Wine, Opal Divine’s Davenport, Thistle Café, and Maudie’s Milagro. Davenport Village is also home to BodyBusiness Health Club & Spa, as well as Davenport Wine & Spirits. Barton Creek Square Mall is located just three miles away in southwest Austin, near Westlake, at the intersection of Loop 1 and Loop 360. It features anchor stores like Nordstrom’s and Macy’s, as well as specialty retail stores, dining venues, and a large, 14-screen AMC IMAX movie theater. More than 170 specialty shops include an Apple Store, Forever 21, Sephora, and Pottery Barn Kids. Eateries include California Pizza Kitchen and Nordstrom Bistro Cafe. The Hill Country Galleria is approximately eight miles from Rob Roy, located off Bee Caves Road. The shopping center offers 152 acres of eclectic shopping, dining and entertainment, as well as upscale office and residential space. Surrounded by a nature preserve that is dotted with wildflowers, trees, and rocky streams, Hill Country Galleria features over 90 retail and restaurant options, including a Barnes & Noble, Dillard’s, and Whole Foods Market, coupled with a Cinemark 14 Theatre. Restaurants include a Madam Mam’s Thai Cuisine, Panera Bread, Tony C’s Coal Fired Pizza, and a Zinger’s Bar & Grill. The Village at West Lake Shopping Center is a short four minute drive from the Rob Roy community. This prime shopping center is home to many of Austin’s most admired specialty retailers like Tyler’s Sports, Provencal Home & Garden, Santa Fe Optical, and Bright Beginnings & Beyond. The center is located at the intersection of Bee Caves Road and the Capitol of Texas Highway. Anchors include a large HEB grocer, Barnes & Noble, and an Old Navy. In addition to retail and shopping spaces, Rob Roy residents will find quick access to an abundance of restaurants such as La Madeleine Country French Cafe, Thistle Café, Maudie’s Milagro, County Line On the Hill, Gumbo's of Westlake, Izumi Sushi, Berryhill Baja Grill, and The Grove Wine Bar and Kitchen. Luxury home buyers with children are often drawn to the Rob Roy neighborhood because of its proximity to the award-winning Eanes Independent School District, (see Eanes ISD homes for sale). Schools in this district are known for their excellent curriculum and extracurricular activities and have won many national and local awards. Bridge Point Elementary (Rated exemplary. See Bridge Point Elementary homes for sale). Forest Trail Elementary (Rated exemplary. See Forest Trail Elementary homes for sale). Barton Creek Elementary (Rated exemplary. See Barton Creek Elementary homes for sale). West Ridge Middle School (Rated recognized. See West Ridge Middle School homes for sale). Hill Country Middle School (Rated exemplary. 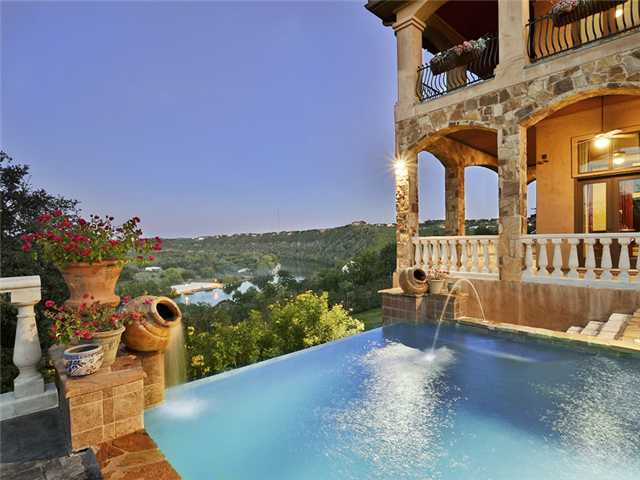 See Hill Country Middle School homes for sale). Westlake High School (Rated exemplary. See Westlake High School homes for sale). As a resident of the Rob Roy neighborhood, residents are required to become members of the homeowners’ association, which requires a reasonable annual fee. The association helps protect residents’ property investments and also organizes several community events throughout the year. More information, including a calendar of events and neighborhood news, can be found on the association’s website, The Rob Roy Homeowner’s Association.